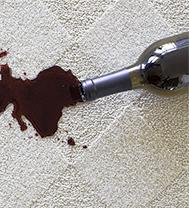 Carpet is an easy target for household spills and stains. When these occur, treat all spills and stains immediately. The longer it sits, the more difficult it will be to remove and the more likely it will be to leave a stain. Absorb wet spills as quickly as possible by blotting repeatedly with paper or cloth towels. Always blot—never rub or scrape abrasively. When blotting, work from the outer edge toward the center of the spot to avoid spreading the spill. In the event of spills that can stain (wine, coffee) try using small amounts of water to dissolve the stain, again blotting repeatedly and working from the outer edge to the center. If you use a cleaning agent, always follow up with water to remove detergent residue that may become sticky and cause rapid re-soiling. There are several recommended products for carpet cleaning available either at your local grocery store or from your flooring retailer. Draw out any remaining moisture by placing several towels over the spot and weigh them down with a heavy object that will not transfer color. I basically just step on a towel to absorb any remaining moisture. (Hey, no cracks about "heavy objects.") Let sit overnight to remove as much moisture as possible. For food spills, gently remove as much as possible before blotting with a wet towel. For pet urine, follow the same procedures using an approved cleaning solution. StainMaster carpet helps prevent stains.